The first time I bought today's #5, it seemed like one of those minor league type cards that turns out to be unnumbered and gets filed in the trade box. 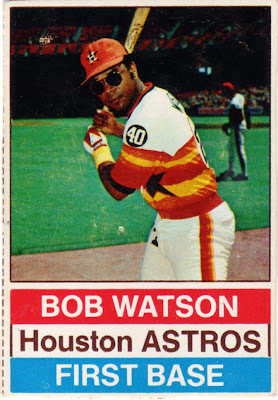 Ron looks like a nice 1970s guy, but my type collection does adhere to one standard. It needs the number. Sometime later, I (accidentally) bought a second, lighter-inked Jacobs card. Oh, there it is. Subtle. 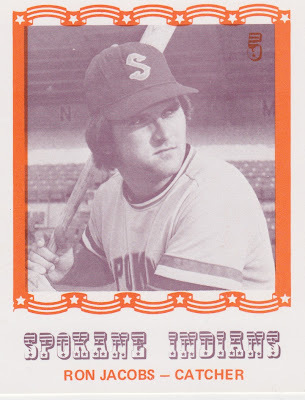 Ron Jacobs might have the #5, but probably confused young collectors by never appearing for Spokane. 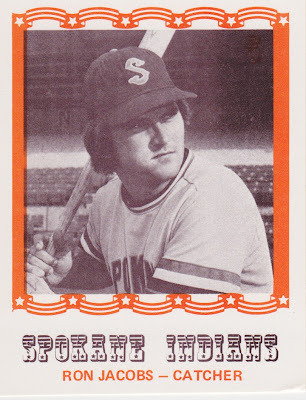 My hunch is that Milwaukee thought about sending Ron to AAA after the 1976 collegiate draft and ultimately farmed him to single-A Newark and AA Berkshire for the summer. He reached AAA by 1979 with Vancouver without quite making the final step to the bigs (career stats). Caruso created numbered team sets for most of the Pacific Coast League in 1975 and I assume they covered the league again in 1976, but this is the first set I've seen in person. The bunting around Ron's picture is a nod to America's bicentennial, much like Hostess went red, white, and blue. Caruso's Spokane set covered 21 players, many who reached the majors and several well-known to 70s-80s Topps card collectors (in bold). 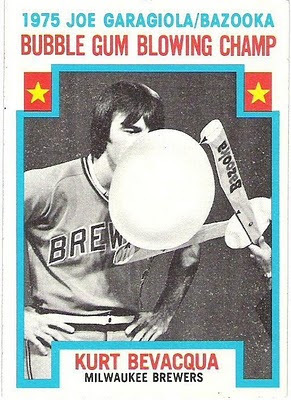 That's the same Kurt Bevacqua Topps immortalized for his off-field skills. And lest you think Bevacqua shies away from his 1975 celebrity moment, check out Cardboard Gods' Books, Bubbles, and Bevacqua.